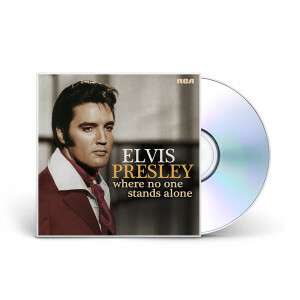 Where No One Stands Alone celebrates the power and passion of Elvis Presley’s gospel recordings. Produced by Joel Weinshanker, Lisa Marie Presley and Andy Childs, Where No One Stands Alone introduces newly-recorded instrumentation, rare alternate vocals from Elvis, and backing vocal contributions from music legends who'd performed on-stage and/or in-the-studio with Elvis such as, Darlene Love; Cissy Houston; Terry Blackwood, Armond Morales and Jim Murray of The Imperials; and Bill Baize, Ed Hill, Donnie Sumner and Larry Strickland of The Stamps Quartet. Hundreds of hours of went into the transferring, upgrading, and enhancing of the original multi track vocals resulting in the richest, most vibrant Elvis vocals on these tracks that have ever been released. The album also includes a reimagined duet with Elvis and his daughter, Lisa Marie Presley, on the album’s title track and spiritual touchstone. Where No One Stands Alone provides new musical perspectives on 14 of the singer's favorite pieces of gospel music, from the reverential to the celebratory, with song selections including Presley's beloved enduring gospel classics (the 1965 Top 5 smash "Crying In The Chapel," "How Great Thou Art," "You'll Never Walk Alone"), praise-filled gospel-rockers (Jerry Lieber and Mike Stoller's "Saved") and traditional hymns and spirituals ("So High," "Stand By Me," "In The Garden," "Amazing Grace"). “Since I was two years old,” Elvis Presley once said, “all I knew was gospel music. It became such a part of my life, it was as natural as dancing. A way to escape my problems, and my way of release.” It was Elvis' explosive mix of styles--blues, bluegrass, country, swing, pop--that generated his iconic world-changing rock n' roll, but it was the hymns, spirituals and church music of his childhood, the deep-seated gospel roots that sustained Elvis and his musical vision throughout his life. I've been an Elvis fan since I was a kid the age of seven when I first seen him on TV in his films, now I have everyone of him on DVD &amp; Video. I have all his records on DVD. Did have them all on LP and Singles once but I lost them over time. These days I buy CDs and DVDS only on him. If new one's comes out. He is The Greatest Man whoever walked on GODS EARTH and I miss him so much. Am now 56 years old and I've lived in the best years on this old planet and am glad I remember Elvis when he was alive. Thank god for moving pictures and sound. So we can watch him any time of the day or night. THANK GOD FOR PUTTING THE KING OF ROCK'N'ROLL. ELVIS ARON PRESLEY ON THIS EARTH. WE ALL MISS YOU. GOD BLESS YOU ELVIS. From a fan. Love the CD but am extremely disappointed. The case was crushed and came apart. Achei maravilhoso! Já recomendei para vários amigos. O atendimento de vocês é excelente. Obrigada. I love, love this cd! Can't wait for the next one. Love the cd. Hope they come out with more. I wish they would come out with a cd with elvis and tom jones duets on the cd. I loved thid cd. Elvis and Lisa s duet gave me the chills. I love hoe they changed the arrangements of each song. Excellent cd. This album is nothing short of amazing! It is modern in its sound, different and at the same time very respectful to Elvis. It really sounds like something he would have done. Of all the ´remake ´ concepts so far, this one is an absolute gem. The more you listen to it the more it sounds like a brand new Elvis album. Nothing is overdone here. This is a sensitive thing for many purist fans but this one deserves congratulations and many listenings. Well done Lisa Marie. It is GREAT as I had expected.No one can sing Gospel like Elvis. The song with Lisa Marie is precious,it’s a shame he isn’t here to really sing together. I can’t believe someone couldn’t have helped him ,so more people could have seen him in concert.